Happy September, my friends! Crappy August is finally over - thank goodness! The kids are in school, the House Cup is starting a new term, and I'm back to days of quiet in which to get my work done. The little guy in the picture is Bob. Khloe found him in the yard and has adopted him. 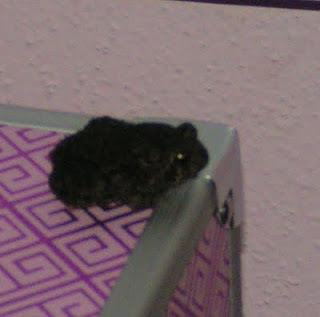 He's got a nice little home with dirt to dig in, a teacup of water, and crickets for snacks. Why did she name him Bob? Apparently he reminds her of me. I'm cool with that - I've been compared to worse in my days! Bob is a cute little guy - he sits on the pile of dirt and watches people. He sat waiting for Khloe last weekend - she was with her dad - and didn't snuggle down in his hole until she came home. She's very attached to him and plays with him alot. Unfortunately she now believes that she's responsible enough for a fuzzy rodent-type pet. Sigh. Last month was unusually cool - I drained the pool because it just wasn't swimming weather. I got alot of knitting done. We had a knitalong in the House Cup for the Ice Queen pattern from knitty - a beautiful beaded lace cowl that's had my eye for the past year. I dyed some merino-silk laceweight from Knit Picks to make it. My dye job is perfect - rick, jewely blue with the shine from the silk and depth in the wool. GazeboGal, my friend and hero, sent me some gorgeous bronze beads. My new cowl is perfectly Ravenclaw! 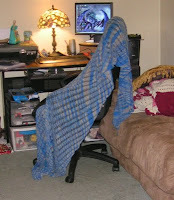 I finished my Ravenclap, too - the huge blue and silver clapotis that was supposed to be done for the movie release but didn't quite get there. It's great. I have some of the second skein left so I've been thinking about knitting something small with it and dyeing it dark red so the stripes will be red and violet. I also squeezed in a couple of pairs of socks for the Summer of Socks. The Horcrux pattern was so easy and fast to make. The zigzags don't show as much on mine as they do on others I've seen but they'llbe hidden by jeans so it doesn't matter. They're knit in Socks that Rock - I love the fabric that STR makes when knit up. It's nice and solid and squishy. The Lenore pattern was fun. The cuff is a cool diamond pattern and then the eyelets down the foot look nice. 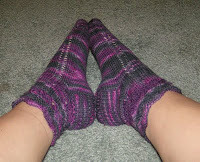 I made them in Handgefaerbt - my favorite sock yarn. I have enough left from the skein for another pair of socks. Obviously I still can't get the pictures where they need to be. Please, if you can help me with my lacking computer skills, come over and show me. I'll make cookies! We've been having alot of issues with this computer lately. Maybe I have worn it out. I don't know how many of you watch pro wrestling. On Monday nights there's now a guest host who runs the matches and such. I want to do it! Of course, being surrounded by all of the eye candy would probably make me speechless, but it would be fun to try. Too bad the Rock wouldn't be there - he's a bronzed nugget of man candy with humor and great teeth - and y'all know it! Mrow, baby! Yes, I'm in a swap! I'm excited, too. It's in the Battlestar Galactica group that I'm in. The idea is to send your partner something from stash! My partner likes books, too, so I've got a book from my library for her and I'm knitting a little something for her. I need to ask her about colors - she likes red and wouldn't you just know that there's really no red in my stash! Now, if she was a purple person I'd have no troubles at all! In the next few days I plan to do a bit of redecorating the blog. Don't be surprised if things look different! I'm compiling some new links and deciding what can be gotten rid of. I may find some new wallpaper, too. p.s- I hope the little guy is a hamster. lol. His eyes shine green...lol.